This picture is from 2001 DCI Hall of Fame member Jim Wedge. I saw the 1964 Boston Crusaders Forzato photo and it got me thinking about when I competed against them in the late 1950s and early 1960s. 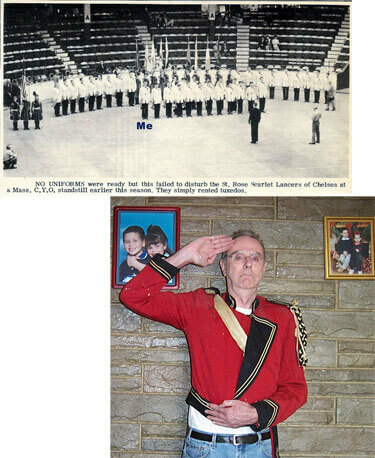 I dug up a 1960 photo of me in competition and a recent photo with my old St. Rose Scarlet Lancers jacket on. Note the moth holes on the sleeve and me holding the bottom because I couldn't fasten the snap. It's too tight! I was wondering how many of today's Hall of Fame members have pictures to post of their marching days. It would be interesting to show today's marching members how we all started out just like them.